25 Prong Round: This needle is a larger version of the 15 prong round. The 25 can be used for soft f..
33 Prong Fine Round: The 33 is a fine point, round style needle. This configuration is used for brow..
52 Prong Fine Round: The 52 is a fine point, round style needle. This is the largest fine, round con..
70 Prong Fine Straight: This configuration has five rows of fine needles set very close together. 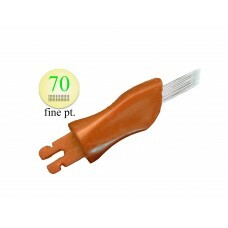 Th..
10 Prong Fine: This configuration is used for very fine, detailed work. Fine needle configurations h..
114 Prong Fine Straight: This is the big one ! The 114 is used on lips, areola, and scar camouflage .. The 12 prong is one of the most versatile needles available. It may be used to shade eyebrows, tap a..
14 Prong Curve: This fantastic needle is the ultimate tool for beautiful hair strokes in eyebrows. T..
15 Prong Round: This needle gives a softer spray of color and is perfect for medium lip liner (after..
16 Prong Fine Curve: This needle is a finer, tighter version of the 14 Curve and is used for smaller..
18 Prong Fine Round: The 18 is a fine point, round style needle. This configuration is used for eyel..
24 Prong Fine Straight: The 24 is what we like to call a "workhorse needle"! It applies gorgeous eye..
28 Prong Straight: The 28 prong needle configuration consists of two rows of 14 needles set at regul..
3 Prong Round: This is our smallest needle configuration. A 3 round has three needles set close toge..
36 Prong Round: This needle is a larger version of the 15 prong round. The 36 can be used for soft f..
39 Prong Fine Straight: This configuration has three rows of fine needles set very close together. T..
42 Prong Straight: The 42 prong configuration consists of three rows of needles set at regular inter..
5 Prong Straight: A great configuration for small details. 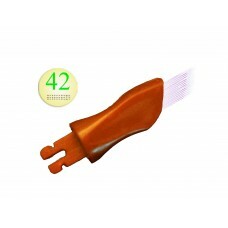 5's may be used for the tails and bulbs o..
56 Prong Straight: The 56 is a quadruple row configuration, awesome for applying thick upper eyeline.. The Genuline 6 Fine curved needle is used for delicately etching individual hair strokes into eyebro.. 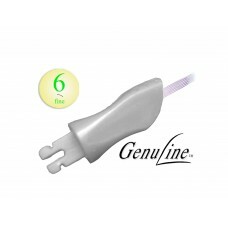 The Genuline 6 Fine regular needle is used for delicately etching individual hair strokes into eyebr..
7 Prong Straight: The 7 prong needle is one of SofTap's most popular and versatile needles. It can b..
7ss Prong Super Smudger: This is the best needle for applying smudgy soft fill brows or smudgy eyeli..
8 Prong Round: This configuration is a larger version of 3 Round and is great for eyelash enhancemen..
84 Prong Fine Straight: This configuration was created for filling in lips, scars, or areolas with b..
87 Prong Round: This needle is a larger version of the 36 round, and is used for filling in large ar..
9 Prong Straight: The 9 prong needle is very popular and very versatile. 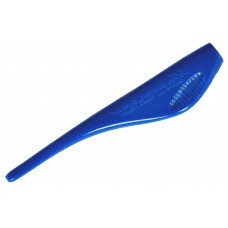 It is often used for thin e..
A single use, disposable handle that will fit any SofTap Click Tip Needle. 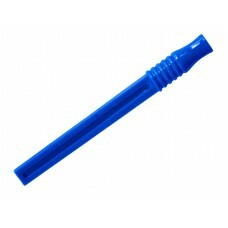 This is a straight handle..
A single use, disposable handle that will fit any SofTap Click Tip Needle. This is a gently curved c..